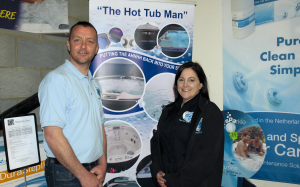 Hampshire’s very own ‘Hot Tub Man’ is celebrating his 20th anniversary in the industry this year. After two decades in the spa and hot tub business and having owned his own company for just over 14 years, Jamie Giles is putting his skills and knowledge into expanding the sales side of the business over the next few years. “The name The Hot Tub Man started as a nickname and it stuck,” reveals Jamie. “We would always get people ringing up the office and asking for The Hot Tub Man and eventually I decided to adopt the name. I now answer the phone as The Hot Tub Man and it makes life a lot easier!” he jokes. Jamie’s company – Spa Maintenance Services – specialises in hot tub installs, relocations, servicing and repairs. The company also sells new and used hot tubs and supplies covers, accessories and chemicals. “We get most of our custom through word of mouth recommendations, which is by far our biggest marketing tool,” he says. “We have a loyal following of customers and we are a wellknown, reputable and trusted company in the area”. OPPORTUNITY KNOCKS : The Hot Tub Man began his career at Spaform, where he worked for six years across many areas of the business and learnt the technical side of spa installations and repairs. With the ambition of one day running his own business, Jamie leaped at the opportunity to start his own spa maintenance company with his wife Julie in May 2003 and Spa Maintenance Services was born. “I had always wanted to be my own boss and there seemed to be a gap in the market for a spa repair service that I knew I could fill,” explains Jamie. “My wife Julie was also looking for a job after having our family so we took the plunge and formed the company. I worked on the tools and Julie handled all the admin and office support.” The couple started out working from home but soon outgrew the space and moved to a unit on an industrial estate. The current premises is located on Bottings Industrial Estate in Botley, and comprises an office space above a retail shopfront with a number of hot tub models on display. At first the company’s trade client base dominated the workload as Jamie carried out deliveries, installations and repairs on behalf of a number of spa retailers across the country, but nowadays the trade side has quietened down and Jamie now sells the Artesian Spas range of hot tubs, as well as continuing to do repairs and maintenance. His client base extends from the west side of Dorset to East Sussex and up to Oxford.